Insurance is a form of risk management. It is a promise of compensation from the insurer to the policy holder for specific future losses in exchange for a regular payment. It is designed to protect the individual, business or organization from an unexpected loss and secure their financial well-being. Some of the most extreme cases of financial loss to individuals, businesses and whole regions result from natural catastrophes. In 2017, the insured losses worldwide reached approximately 144.31 billion U.S. dollars. Weather related losses cost the insurance industry 136.44 billion U.S. dollars, man-made disasters cost 6.25 billion U.S. dollars and earthquakes cost 1.62 billion U.S. dollars. The earthquake most expensive to the insurance industry since 1980, took place in Japan in March 2011. The total losses were estimated to be 210 billion U.S. dollars while only 40 billion U.S. dollars were insured. The most costly typhoon to the insurance industry occurred in the United States in 2017. Hurricane Harvey incurred 95 billion U.S. dollars of total losses, out of which only 30 million U.S. dollars were insured. 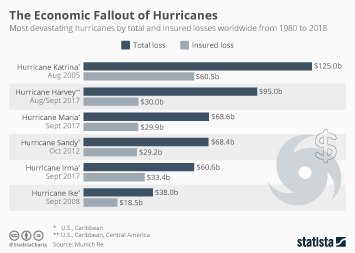 The most costly insurance loss worldwide resulting from a natural disaster since 1970 amounted to 82.39 billion U.S. dollars and was caused by Hurricane Katrina, which hit the United States in 2005. Man-made insured losses are those caused by fires and explosions, mining accidents, aviation, maritime or rail disasters. In 2017, major fires and explosions worldwide cost the insurance industry approximately 5.44 billion U.S. dollars and were the most significant insured loss among the mentioned categories. The most costly terrorist attack took place in the United States in 2011. The insured property loss resulting from the crash of hijacked airplanes into World Trade Center and Pentagon amounted to 26.22 billion U.S. dollars. More interesting topics from the industry "Catastrophe Insurance"